Dehydrating meat that is pre-cooked and pre-sliced makes this task easy – we have the perfect way for dehydrating meat safely! Are you ready to make lots of great stews and soups!? Meats are the building block of proteins for the body, and it's so easy to have your own dehydrated meats on hand. 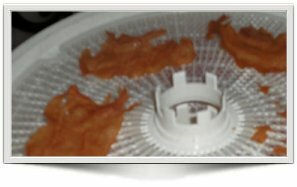 Dehydrating Meat: Use Pre-Cooked Meats! The Easiest Way To Preserve Meat! Meats can be preserved by smoke, freeze-dried, or cured by salt. But we're all about the 'easy' here as in 'easy'-food-dehydrating! So for example, when preparing chicken for the family dinner, put some extra chicken in the cooking pot and save it to dehydrate later on! Or as my brother says, "I'm saving it for Ron" – "late...R on" !!! Check out our "re-hydrating" page – and consider using chicken/beef stock when re-hydrating meat! Adds more flavor, that's for sure! Important: While vegetables re-hydrate very well, I cannot say the same for meats. You may experience a more chewy texture than you'd like ... but it's better than not having any meat available at all, that is, unless you are a vegetarian. Feel free to experiment with longer re-hydrating times for less-chewy meat! What's The Ideal Temperature To Use for Dehydrating Meat? 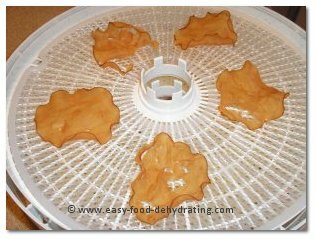 Cooked meats are best dehydrated at 160°F – but please consult your food dehydrator's owners manual for their specific instructions. Your meat is already cooked, so that's one step saved – so no further preparation is necessary for dehydrating meat this way. The best meats to use are choice cuts – the tender cuts – so they won't be chewy or tough. The less fat on the meat, the better as it's the fat in meat that causes the meat to go rancid. Learn which beef cuts are best for dehydrating at TheMeatSource. This site has tons of great info. on how to cook meats properly! 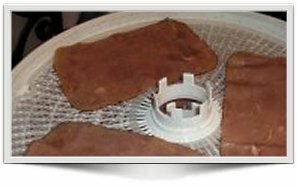 Dehydrated meats are perfect to use in stews, soups, or in a Beef Stroganoff for example. Make sure the meat pieces are SMALL so they re-hydrate more evenly. Vacuum sealed dehydrated cooked meats can last up to 2 to 3 weeks at room temperature. To maintain the quality of dehydrated meats, please refrigerate or store in the freezer until ready to use. Dehydrated meats will stay fresh for up to six months in the freezer – without freezer burn! Check out some of our recipes like Beef Stew, Chicken Soups, and much more! "Go to the deli counter and get lean roast beef, turkey, or chicken and have them slice it about 1/16 inch thick. When you get home, slice it into strips and dehydrate. I use it for a quick snack or when camping. As mentioned by Susan, freeze it until you are ready to use within the time limit. Vacuum sealing keeps moisture from getting to the jerky." – Thanks, Paul, for writing in! "I do a lot of dehydrating for long hiking trips, and have found that the canned chicken (that looks like canned tuna) in the supermarket (yes sounds gross) is the only chicken I've been able to dehydrate that re-hydrates exactly like it was prior. Taste and texture on re-hydration is perfect for chicken, just remember to buy the low fat canned chicken". Hi Sarah! That's really great to know! I actually have been known to use the 'canned chicken' in soups and chicken salad! :-) And yes, the low-fat stops rancidity when storing "long-term". Thanks so much for posting! I am a mother helping her son raise his children. There are 12 of us in the household and often times feeding all of us has been somewhat of a challenge. 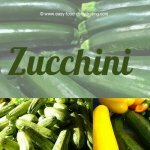 Thanks to you I was able to take advantage of a markdown sale of fruits and veggies. 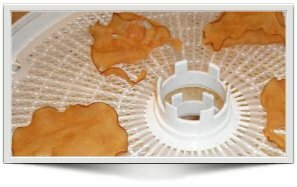 Without proper freezer storage I usually have to pass on the sale, however I found a dehydrator at a yard sale and have used it for the first time. The kids think I'm the greatest with the apples, and today I will try veggies. Can't wait to find those meats on sale! THANK YOU again — you are a treasure! God bless you and your family.